You have to arrive early at my church to sit in the back row. So why put the back row so far away from the stage in your next meeting? "Bowling alley" (stage on short wall) seating is the least effective meeting layout. Always try to put your presenter on the long wall. This allows more people to sit closer to the front - and a bigger back row. It is ideal to have the audience walk into a meeting from the back of the audience. That way they don't disturb everyone when folks come and go. If the entrance has to be on the side of the audience, install a 10' wide pipe and drape inside the ballroom, 8' from the entrance door. At least the distraction of opening and closing the door is eliminated. Two other seating notes: NO CENTER AISLE and STAGGER THE SEATS. Why no center aisle? That is where the best seats are. Have you ever seen a center aisle in a movie theater or broadway play? No you haven't. You also don't see one chair placed directly behind another in any real theater. So why do you accept hotel seating that way? Remind the setup crew this is true theater seating - one seat half way between the seats in front..
Request an 18" - 24" walking space between rows. This encourages people to fill in a row without those on the isle having to stand up to let them in/out. If allowed, set each chair 4" from each other side-by-side. The average width of a banquet chair is 18". The average width of the typical audience member is more than that. It will take some extra time to set the room but when you take these steps you get a happier audience and a more productive meeting/event. You will hear many excuses from the setup supervisor. Agree on room layout guidelines and theater seating before you sign the contract. You will have to be prepared for the venue to repeatedly say "nobody has ever complained about the way we set a room." Best practices are on your side BEFORE you sign the contract. For a real world seating capacity chart try this instead of the inflated capacity charts from the hotels. Hotel capacity charts don't consider safe side aisle or comfortable seating. Most fire marshals will not allow the published capacities. Check out a Google search for ballroom meetings. Look for good and bad setups. Don't be surprised all pictures are taken from a standing position in the rear of an empty room - it doesn't represent what any audience member sees with someone sitting in front of them..
Click "follow" to receive notice of the next post. Clients expect us to manage the venue, the vendors and the on-site production, including planning, move in, rehearsals and calling the show. Meeting planners are forced to deal with so many issues deciding one venue from another I try to do what I can to help them make decisions based on the physical limitations of a particular venue. Our clients call us in to the final negotiation between multiple venues prior to signing the contract. We assist in establishing relative costs between the preferred venues. Cost of production can often be a hidden surprise if this step is skipped. Often misleading, all hotels publish a seating capacity chart. That chart uses an unrealistic formula for determining the maximum capacity in any meeting space. Of course it is to the venue’s advantage to convince meeting planners their meeting will fit in one room. Hotel capacity charts do not take into consideration the use of a stage, AV or proper seating plan for meetings with production. For example, in order to show the maximum capacity for a banquet the hotel may squeeze 12 people at a round table. They may even base capacity on very crowded 60 inch tables not the standard 72 inch wide tables. They will often squeeze tables closer together than any fire marshal would permit. Crowding tables together effects loading/unloading a room, meal service and common safety issues like sizable side isles. The hotel will often provide a chart made by their banquet department but there is no reference to scale or consideration for an effective event. 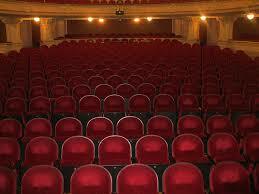 A more realistic seating capacity chart is found on the internet at calculator.stageamerica.com. Using this calculator planners are able to determine the necessary square footage based on real world and needs for AV dance floors and size of tables. Another issue often misrepresented in hotel seating charts is the effect if ceiling height in any room. True ceiling height In many venues rooms are divided by air walls. Because of the high cost of good air walls, architects often drop the ceiling to allow air wall tracks 2 to 3 feet lower than the effective ceiling height. This becomes an issue with sightlines, establishing the proper size projection screen or stage lighting in the room. When doing a site inspection we take laser measurements to the lowest point in the room not just in one spot but many locations. The other object robbing events of affective ceiling height is the chandeliers. In one beautiful new JW Marriott venue the 22’ ceiling is obstructed by giant chandeliers some designer convinced the owner was an asset. Instead it has lost the hotel many high value meetings due to these monolith obstructions. At the Bonaventure hotel in Los Angeles a few years ago I was confronted by the banquet manager why it was I’m measuring the ceiling height in their meeting space. He said no need to do this because we’ve just published a new brochure. He retrieved the brochure and pointed proudly at the 16 foot ceiling in the diagram. When I showed him my laser measure of 14 feet 2 inches he was certain I was making a mistake. However, after a few minutes discussion he remembered the brochure was printed without checking the results of recent sprinkler additions to the ballroom ceiling. I have not met a banquet manager or hotel sales manager yet that understands the nuances of seating charts, AV requirements, or ceiling obstructions. “Oh yes, we have a 22’ ceiling.” When proven wrong they are often surprised. Other issues considered in a site inspection by Stage America technical staff include access, size, capacity, competing resources, and relative mechanical health of the elevator. One Fort Lauderdale, Florida hotel booked a car show in their new ballroom without considering their second floor ballroom had no freight elevator. The meeting was booked, the deposits were received, and the hotel was about to open this new space when we were called. The only solution to get two new cars in the ballroom was to cut a garage door size hole in the side of the building and arrange for a super heavy fork lift to access the 22 foot high hole in the wall. Cost of electricity, use of hotel sound system, and even rental of stage decks are not covered in the contracts. Those costs often followed in a rider describing those extra costs. A technical site inspection should be the final step before signing a hotel contract. Find more detail at: http://goo.gl/lPst8.